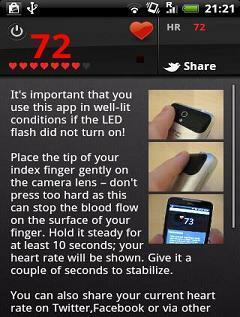 Instant Heart Rate - Measures your heart rate using the built-in camera. Place your finger gently over the camera. Hold it steady for at least 10 seconds. Your current heart rate will be shown on the display. 1.5.0 Brings social sharing features.